That's right!! A Nutella jar!! The rounded form of the new design nutella jars was perfect for this project, hence: we've been eating nutella until it was coming out of our ears around here recently! Having eaten all the nutella (*sick) , I cleaned them out then soaked the labels off in warm water. Then I prepared them for spray painting: When spray painting glass, it is best to prep the surface first by cleaning it with Isopropyl alcohol (commonly found in cosmetic brush cleaner, which is what I used). I figured it would be best to spray the inside of the jars, so that the macramé wouldn't rub off the paint with time, so I covered the outside of the jars with masking tape, before spraying the inside copper. TIP: It is better to spray several thin layers, letting each layer dry before the next to avoid drip marks! Next, I got some 3mm white cotton cord to make the macramé with. 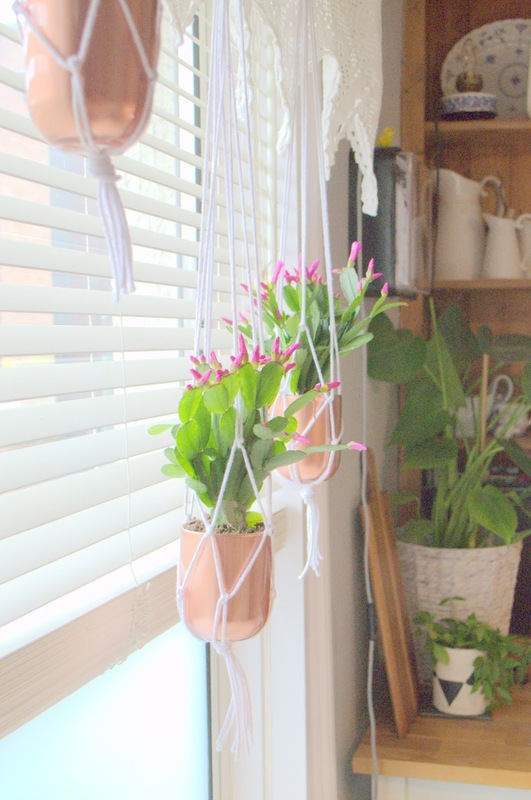 How much cord you need will depend on how long you want your macramé hangers to be, but I would suggest to aim for no shorter than 1 meter... 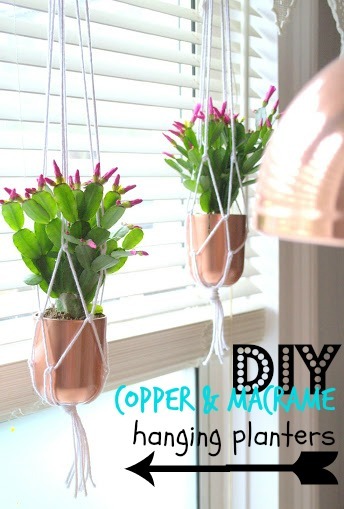 So for each macramé pot cradle, you'll need 8 pieces of cord in the same length (minimum 1 meter).. STEP 1: Gather them together and tie a knot at one end, leaving a 5 cm tail of cord....this will be the bottom of the macramé pot cradle. STEP 2: Lay your knot on a flat surface, and separate the cord into 4 sections with two strands per section. STEP 3: Taking one section of cord at a time, begin to tie the two pieces of rope into a simple Square knot knot, leaving about 3-5 cm above the knot where all eight pieces of rope are tied. TIP: Don't make your knots too tight at this stage, as you may need to adjust them later! STEP 4: Repeat until all the 8 pieces of cord is tied together. STEP 5: Take the left piece of cord from one section and match it up with the right piece of cord from the closest section to the left of it. Tie these two pieces of rope together, about an inch above your previous knots. Repeat all around! You should now have a cross shape in the middle, and the last set of knots you made should form a square shape, like pictured above. Organise your cord to form this shape and align your cords so that you can clearly distinguish each of the four sections. STEP 7: For the final round of knots, take the outermost piece of cord from one section and match it up with the closet piece of cord from the section to the left of it, then tie those two pieces together about 3-5 cm above the previous knots. 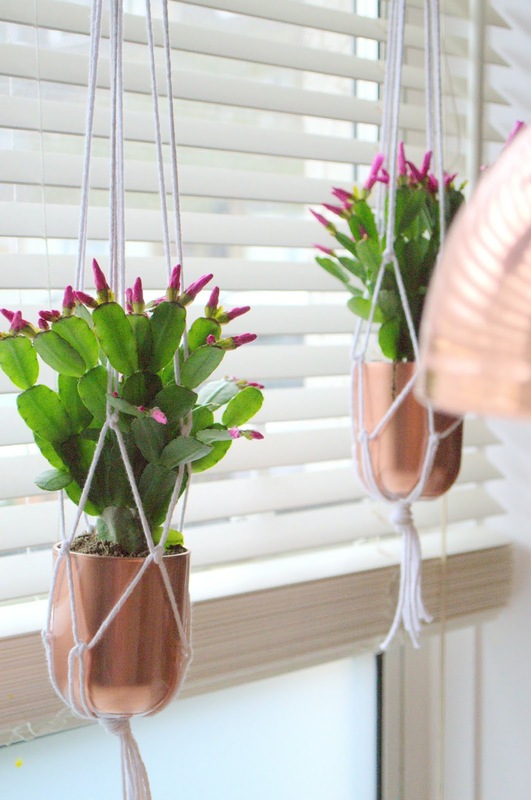 When you've finished tying the cords together, the macramé pot cradle should look like this (Above). 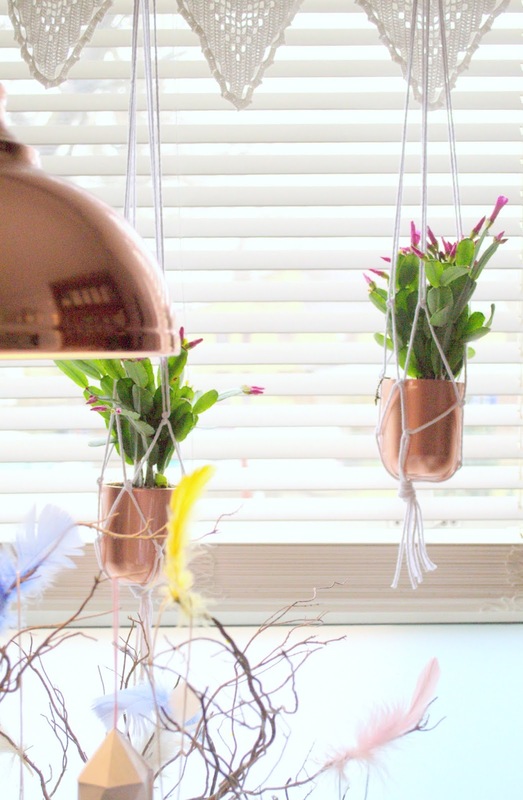 And they are just the perfect size for my Easter cactuses..
To make the 3 hanging planters cost me approximately £4 in cord, and I already had the copper spray paint (approx £6) ....and I don't consider the nutella jars an expense as it is something we eat on a regular basis (however, we may need a break from chocolate spread now...LOL). So get eating some nutella, and you too can make these! Hope you are having a good Easter so far! I will be back with a little Easter related project you can do with the kids very soon...and should you start to feel like you've run out of ideas/activities for the kids during the holidays, please pop back soon , as I will be posting some nice kids activities from the www. next week!